It was off to Highlands again at the beginning of April as I took the old camping equipment but some new hunting equipment to the south side of the loch. The tent was pitched, the Pot Noodles unpacked and the electronics plugged in. After some good old camp stodge (sausage and beans as I recall), it was down to planning the days ahead. Moving onto the trap cameras first and I had left four cameras in position over the autumn and winter to see what objects of interest may pass in front of them. The whole affair proved to be something of a disappointment. On retrieving the cameras and their SD cards, the results were worse than usual. The first camera seemed to have taken a battering from the winter storms. Not surprisingly, this was deduced from the fact that on opening it, water came out! I had placed it too close to the loch and so the lesson was learnt. Did the memory card survive? When I tried to mount it onto my laptop for viewing, the computer failed to recognise a file system on it and so all was in vain. The second camera was in a safer location and for this particular one, I turned it to look along the receding shoreline to see if anything would come from the loch to the shore and from the hills to the shore. Of course, I would expect to see some deer in such a survey, but who knows what else may venture into camera range? To my chagrin, this SD card mounted by the laptop but it had zero images on it! Why this happened was unclear. Were the batteries faulty or had the unit not turned on properly? Either way, a possibly interesting series of shots were lost for this particular season. The third camera retrieved did have the expected large number of shots of the loch, but for some reason a large proportion of them were night shots with no real detail. The camera was triggering and doing its triple shots - but every 15 seconds until the 8Gb memory card filled up! As a result, the camera only operated for 12 hours. I had not seen this behaviour before and assumed they were night shots, but I would have still expected to have seen some detail on the images since the infra-red light flash should illuminate whatever is triggering the heat sensor. This could point to a camera fault and further retesting would be required before this one is allowed back into the field. Finally, all was well with the fourth camera as it gave me a good selection of images to review. This particular camera had been set up to record three successive still images but also record a 10 second video clip. That worked fine and even my concern that video clips soak up more battery power than still shots was disproven as it was still operational. And so we move onto new equipment and I start with the drone I recently bought. It is a DJI Phantom 3 Professional drone with onboard 4K micro SD recording plus live HD streaming to the DJI app running on the smartphone attached to the DJI remote control handset. Hover stability is performed via a choice of GPS, optical or altimeter positioning. Battery life is up to 25 minutes depending on usage while there is a "Return to Home" button when battery levels become too low. I took this drone to Loch Ness wondering how it would perform. The first question on my mind was the prevailing winds which run up the loch and whether those could result in shaky videos. The other question concerned the person controlling the drone. Could I handle it without crashing it into the loch, never to be retrieved? As it turned out, after a few crashes, I got the hang of it. The main thing is to find a wide open space away from trees and with a nice flat surface to land the drone. There are two things to also concentrate the senses. The first is to keep an eye on battery time left (though the manual claims the drone will return to home if power is critically low). The second is more important to Loch Ness research. By that I mean using the live HD stream to the smartphone plus remote control to guide ones search of the loch surface below the drone camera. It was easy to just keep watching the drone rather than the video stream. That was partly a confidence issue and an unjustified concern that the drone would lose control. The fact of the matter is that you could send the drone 400 feet up into the air and a thousand feet across the loch and then go away for a 20 minute walk and the drone would still be there hovering at much the same spot. I went onto "Dinsdale Island" and put the drone through its paces and it performed wonderfully. I was less inefficient in not keeping my eye on the live stream enough plus I moved the drone about too quickly resulting in a a rapid video which made reconnaissance more difficult. The video below shows one such sequence. I am sure Tim Dinsdale would have loved operating this device. Now this uploaded video has been downscaled, so I invite you to stream one of the original HD videos of the loch from this link and gives you a better sense of what is seen "in situ". I have not actually checked the 4K resolution recordings made on the micro SD card which offers four times as many pixels at HD resolution (using 1080p as a guide) though there are some mitigating factors. As it happens, the HD live stream is also recorded to the smartphone and used for this article. By coincidence, on my arrival I noticed another drone in operation at Foyers beach. I got chatting with the owner as it seemed he was also recording the loch surface below though I got the impression he was not monster hunting. That drone was black and about the size of a crow, which probably explains why it was attacked by crows when it hovered near their tree! Another thing to watch out for I suspect. The upshot is that the drone will form part of future trips to Loch Ness. Another new piece of equipment brought into play was the Flir TS24 Pro thermal imager. I already use a Yukon Ranger image intensifier which works on the principle of gathering and intensifying the ambient light. 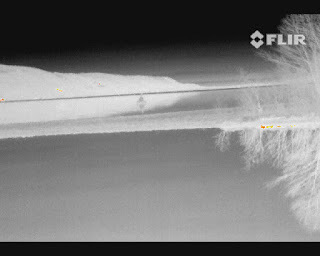 The Flir works on the principle of forming an image from the infra-red spectrum, no matter how little optical light is visible. It can record video or snapshots to a memory card as the still image below demonstrates. Here the image is coded to more heat means a brighter image and shows the mouth of the River Foyers. You can make out the green buoy near the centre. The advantage the Flir has over the Yukon is the SD memory card storage while I was obliged to use the composite video port on the Yukon. This involved connecting a video to USB cable to a laptop which was running some video recording software. Obviously this led to a lack of portability and so the Flir offers more flexibility in where I could go and how fast I got there. The video clip below shows the same area as I switched through the various heat display modes on the camera. I did not use the Flir much over the weekend and was rather breaking it in for Loch Ness use. When I next go up I would anticipate using it later at night scanning the loch for activity, possibly in conjunction with my usual dawn run. Making some enquiries revealed nothing new locally about the monster but one account came to my attention which I reproduce here concerning a Foyers man by the name of Alexander Rybak who is now deceased but his story was passed on via another. Ali was a man of Polish extraction whose father had stayed on in Britain having served in the RAF during the war. I was told and agreed that the older generation tended to keep quiet about their encounters with the beast and Ali was no exception. However, Ali was a bit of a cynical person by nature and had always scoffed at the idea of a monster inhabiting Loch Ness and whenever someone claimed they saw something, his reply would go along the lines of "How much whisky have you been drinking?". That all changed some time during the late 1970s or early 1980s when he was chopping wood with another man between the Foyers Hotel and Inverfarigaig. It was related that he saw a salmon leaping out of the water in the loch below. There is nothing unusual in that but what followed was. For in pursuit of the salmon was the Loch Ness Monster, breaching the water with its head and neck attempting to bring its quarry to an untimely end. Rybak had his "Monkees Moment" - then I saw its face, now I'm a believer. Ali's cynical attitude to the monster and its adherents changed, but I was told he kept it quiet and never told his family, save his mother only. As to how factual and accurate our tale is, it would be great to find this other man who was chopping wood with him that day. Perhaps he is still with us and could corroborate the testimony. Otherwise, weave this tale into the great Loch Ness Monster tapestry. I did not have a sighting myself that summer. However, some of my fellow workers did. Four of them had gone to sit at the end of the canal onto the loch one evening. What looked like an upturned boat bottom rose, moved towards them (against any current) then sank out of sight again. One of these people was a law student. I and some others had been out for the evening, when we returned, the law student was seated in shock and trying to logically equate what he had seen, whilst the others with him recited the tale. His training wouldn't allow him to believe what he had witnessed, but he could not deny that he had. His reaction convinced me completely. I would imagine that given his calling it is not something he would advertise today, or even any more admit to. But his reaction at the time gave me no question of doubt. One wonders how many sightings go unreported and escape the attention of the media and, unfortunately, serious researchers? So another trip finished and no personal sighting of Nessie. There was that inconclusive splash last September and I have had one or two other odd experiences, but one has to be level headed with oneself and take the position that after thirty years of various trips to the loch, I have not seen the creature. Having said that, I can hardly say that over that period I have been a gung-ho monster hunter. I have not gone up every year for weeks on end spending dawn to dusk scanning the loch with my binoculars and bleary eyes. One reason, but not the only one, is purely down to the fact that monster hunting is a high cost and low benefit exercise. Some people arrive at the loch for the first time and see the beast. I think of Dinsdale and Holiday in this regard. Others will get their reward after years of diligence whilst most will end their lives having seen nothing. Mind you, I often wondered what would happen if I did have such a sighting. Would such an event be a game-changer to the extent that the subject would become an overarching obsession? We have seen what happened to others when that sighting "link" becomes established - Nessie become the day job as well as the hobby. Perhaps I should be careful what I wish for. But without that paradigm shift, the initial enthusiasm wears off as the reality that Nessie is not a surface creature by habit begins to bite. After all, imagine trying to spot an eel of any size in Loch Ness from the shore. Some react to this dilemma by just walking away from the subject. My reaction is to automate the search and take it literally to new heights. Onwards and upwards. I love the drone videos. For reference, about how big is that green buoy? About the size of a human. I could have gone further out and up, I will push the envelope more next visit. What is that white froth on the loch surface ? I've seen that many times and wonder why it takes so long to dissipate. Bad luck re the cameras you left in situ, such is the frailty of electronic gadgetry when used in the field. A mustard coloured boat sized object on the surface for nearly 60 minutes. Didn't Holiday wisely later recant his "sighting", thinking it probably a boat ? I believe the froth is due to Langmuir circulations. I was not aware of anything on the written record regarding a Holiday change of mind, any ref would be appreciated. If I recall aright, in THE GREAT ORM OF LOCH NESS Holiday describes this sighting and says an initial reaction was that it COULD have been a boat. He later goes on to dismiss this given the simultaneous sighting by two anglers on the opposite side of the loch who were much closer and confident it was no such thing. I think he wrote a similar account of the sighting in THE DRAGON AND THE DISC. Sorry, don't have either immediately to hand, but I'm pretty certain he was satisfied beyond reasonable doubt that at the end of the day he'd seen the Monster. I will check his last book, "The Goblin Universe". Last two times I stayed at the Loch both locals who owned the places I stayed at told me quite certainly they'd seen something and that the monster was fact. I actually wished they'd talked more but I didn't want to hassle them. For me seeing anything would not cause me to move there and search for it in perpetuity. Unless I was aiming to capture it what would be the point? I might never see it again. However I would continue to go back and I'd almost certainly raise funds to make a film documenting my experience. Having seen something with my own eyes I wouldn't be embarrassed at all to talk to the press. Whether they'd be interested is another story. Yup I am more persuaded that the number of unreported sightings outweighs the reported ones. Just a word of thanks for all that you do, Roland, to further increase the database on the LNM. At your own effort and expense, and with high dedication. Thanks for sharing all of it with your reading public. “Monkees Moment?” Is that a common phrase or did you just coin it? It’s brilliant!!! It may be out there, but I coined it for this article. Nobody can deny your dedication Roland and your new methods are something different to the hunt.I feel an aerial view of the loch is a great move forward as these animals could regulary be just beneath the surface and not in view from the loch banks. Good luck with your future quest. Fascinating blog. I was unaware that such research is taking place. I await further updates. The surname "Rybak" in Polish means "Fisherman". Sort of appropriate. After a bit of googling I discovered a post from 2014 in the blog from " Burton Carruthers " where he says he read somewhere that Holiday was less sure re his sighting and stated it was probably a boat, however Burton could not recall the source. So it lodged in my memory and this is why I mentioned it in my post. However until someone can find the written source of this alleged and monumental abrogation Ted's reputation is safe.